On the Upper Bowling Green in Castle Park - 2 days of Music, Merriment and some fantastic Real Ales & Ciders. Lots of Local Bands playing over the 2 days, along with a "Meet the Brewer" Session with Andy Skene from Pitfield/Dominion Breweries. Plus of course some fantastic local Real Ale from the likes of Colchester, Mersea, Red Fox & Pitfield/Dominon Breweries + more including locally produced Cider! There will also be various locally sourced Food Vendors, offering their wares! 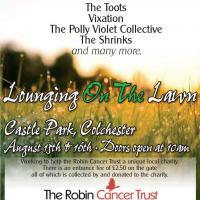 Entrance is just £2.50 each day and all gate money goes to our friends at the Robin Cancer Trust. Should be a grand couple of days!